Olby: Fox News as Bad as the KKK, and Worse than Al Qaeda! Keith Olbermann, unplugged and unhinged. Al Qaeda really hurt us, but not as much as Rupert Murdoch has hurt us, particularly in the case of Fox News. Fox News is worse than Al Qaeda--worse for our society. It's as dangerous as the Ku Klux Klan ever was. Yes, this is the same Keith Olbermann who bellowed that Bill O'Reilly was "worst person in the world", for what? For comparing hate speech on the Daily Kos to...the KKK! The same Keith Olbermann who sermonized against comparing people to Nazis, but donned a Bill O'Reilly mask and did a Hitler salute. Yes, that Keith Olbermann. How will the Fox haters react to this? The gang at Think Propaganda waxed indignantly just two days ago about how reprehensible it was that people like John Gibson were making comparisons between the words of Usama Bin Laden and liberals like Olbermann. How dare he compare patriotic American progressives to terrorists! What will Think Propaganda have to say about Olby's latest outrage? 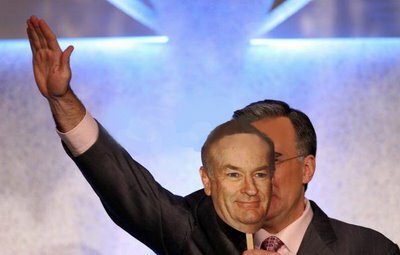 Huffington Post raked O'Reilly over the coals for the Kos-KKK analogy. Can we expect them to do the same to Keith Olbermann? And what about Media Matters who repeatedly slammed Mr Bill for this comparison? What will they say about their hero Olbermann? Here's a hint: nothing! This SOB has lost (what was left of) his damn mind... either that or he knows that the liberal media never holds libs' feet to the fire for unbridled hypocrisy. What a nut. As long as there are Fox fans, there will always be Fox News. That is forever. If Olby had any ratings he wouldn't care about being the underdog; as it is he has to try to compensate for his small audience and small everything else with big declarations not matter how false. Ooooh, big man Olby! Sore loser. i'm addicted to media clips... especially when its olby. hes such a performer. I don't mind listening to liberal commentators but Keith is a COMPLETE a-hat and he makes sure everyone knows it.